Frit’z Adventure is one of the newest attractions in Branson that is buzzing with great outdoor fun adventure without the heat of the sun. This 80,000 square feet facility features hand-on climbing, sliding, tunnelling, and zip-lining adventures. 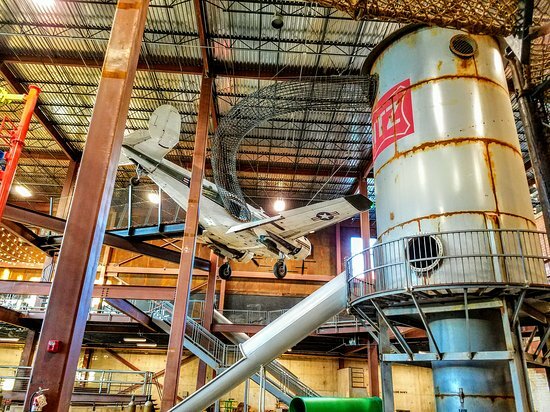 Inside, the facility has daunting utility poles to climb, bridges suspended stories above, towering rock climbing walls and giant boulders, three impressive warped walls, urban brick buildings for scaling, a massive ropes course, a life-size water tower, multiple slides, tunnels and tubes to burrow in, and an air-worthy airplane to explore. Frit’z Adventure is the newest adventure-filled destination that you should not miss this season. This family attraction in Branson brings the excitement and challenges of outdoor adventure in a multi-dimensional indoor environment. This $10 million facility is a part of Branson’s New Spirit of 76 project designed to revitalize the famous Highway 76. It is beautifully located at the site of the old Silver Fountain Inn, next to the Dixie Stampede on west 76. This is the conglomeration of natural and man-made structures. This family attraction offers ultimate thrill-package experience that gives every guest a unique way of enjoying wholesome fun and excitement of thrilling outdoor adventure under a roof. As one of the newest family attractions in Branson, Frit’z Adventure provides every visitor many challenging outdoor adventures inside a multi-dimensional indoor facility. Although this indoor facility delivers a perceived element of risk, it is strategically engineered and durably constructed so that guests can enjoy a safe adventure in a much secure environment. This unique attraction in Branson is where you can enjoy the elements of the world around you and experience extreme outdoor adventure in this indoor facility. Visitors of all ages are encouraged to enjoy the fun and experience extreme outdoor adventure inside the facility. In addition to extreme outdoor adventures offered in this indoor facility in Branson, Fritz’s Adventure features a restaurant that offers healthy menu choices. The facility has indoor adventure park in upper mezzanine and rooftop party rooms that are perfect for big groups of any occasion. For the first time in Branson, Fritz’s Adventure offers challenging adventures that are normally reserved for seasoned adventurers. Anyone can join this challenging adventure as there’s no discrimination on age and ability level. With your visit to Fritz’s Adventure, you are sure to experience a world of great outdoor adventure year-round in an indoor environment. Fritz’s Adventure has its favorite sayings called “Let the Adventure Begins”. Whether you are a first-time adventurer wanting to experience the thrills of outdoor adventure or a seasoned adventurer looking for a challenging adventure in an exciting indoor environment, Fritz’s Adventure is the place to go. The place is a perfect destination for families who want to bond together. Young and old adventurers will be able to enjoy extreme outdoor adventure in a world that wouldn’t be possible in any other scenario. As one of the newest family attractions in Branson, Fritz’s Adventure is a unique destination spot where you can enjoy extreme outdoor adventure in an indoor environment.